I think this is released today in the US? Hopefully an ebook version, too? It's for sale in the US and I placed my order at Amazon there shortly after it became available at midnight last night. Only a trade paperback version both there and in the UK, however, no ebook as yet. This is common with upscale mainstream lit releases. Hence, I presume Mr. McAuley's publisher(s) have reasoned that AUSTRAL -- between its literary virtues and its cli-fi world-building -- will be most profitable if full value is extracted from its dead-tree iteration first. Hi Brian and Mark - thanks for the feedback. 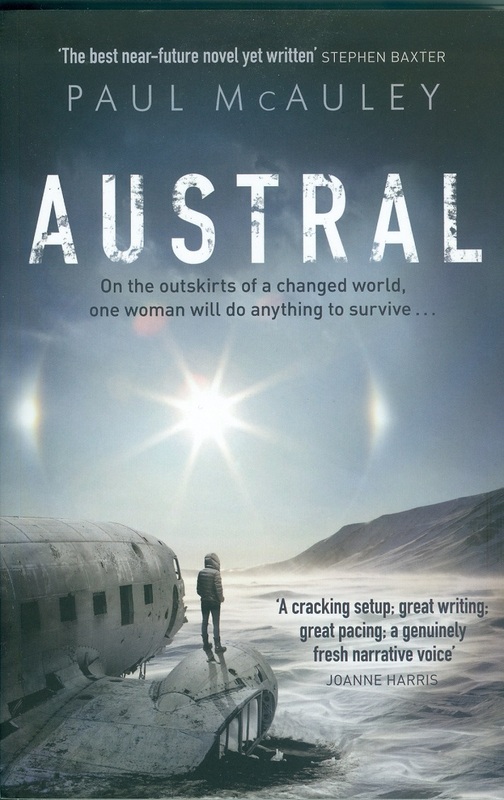 AUSTRAL is available as an ebook in the UK, at least. I'm getting comments from other sources that amazon.com aren't making either the trade paperback or the ebook available in the US (pages for both are visible from the UK, but geolocation means that I see things differently). I will check with my publishers first thing Monday. Meanwhile, any US reader who wants the trade paperback should check out the Book Depository - there's a discount and free postage. Congratulations! Intriguing cover blurbs; representative from what might be perceived as hard-as-nails end of SF mixing it up with author from apparently 'softer' end of literary fiction (though I suspect both these characterisations are unfair). Makes me very curious as to what kind of book you have written, Mr McAuley! Who Can Replace A Brian?